With the march of the machines on the horizon, Humans Need Not Apply argues that automation will bring a huge decline in jobs. But the book's solution seems unworkable, says John McLaren. Jerry Kaplan is both lucky and unlucky. Lucky because, as he slips in, he lives very comfortably, in a vast house full of gizmos. Unlucky, because if the cards had fallen differently - or perhaps if he was even smarter - he might be as famous and rich as Gates or Zuckerberg. In 1980 he worked on a project which led to someone else founding Symantec. In 1996 he rubbed shoulders with Jeff Bezos, who was starting Amazon, while he himself was founding OnSale, which might have beaten eBay, but didn't. He made the most of the collapse of his tablet computer company by writing an excellent book, Startup, about it, and a few years ago he entered the gaming market by launching Winster, which...you get the picture. He is doubtless content now as a well-heeled futurist and teacher of computer science, but you still sense that he must sigh whenever he catches a distant glimpse of a Learjet. The book starts with an enjoyable history of AI. I enjoyed the account of an early robot running amok - in 1972 one of the first computer-controlled arms was not bolted firmly enough to a table and broke free, rampaging all round the lab, cornering one terrified worker, until some brave rescuer dived to yank the plug from the wall socket. However, it is the phrase in the subtitle about 'wealth and work', which gives away the real centre of gravity of the book. We are warned that automation may bring a mass fall in jobs comparable to the collapse around a century ago in the levels of labour in agriculture. The dollars value of sales per head by Walmart employees is only a quarter that of staff at Amazon, which suggests that if there is a further big shift from bricks to clicks, many jobs will go. Other examples he offers include drafting of simple legal documents and basic diagnosis in clinics. It's not altogether clear, however, why eliminating the more routine of legal tasks would be any more lamentable than the disappearance of typing pools a few decades ago. And might not beleaguered GPs be relieved to dodge hand-to-hand combat with patients who have prepped themselves with a Google-fest about their symptoms? His big idea to help society cope with vanishing work is a 'job mortgage' in which companies with a future need for certain skills might provide some sort of 'sponsorship' to people willing to retrain. The sponsorships would not extend to any firm job offer, nor any cash support, but even such vague expressions of interest would, Kaplan hopes, be sufficient for applicants to secure loans to finance their studies. The loans would be repaid from income once jobs started, and if no job materialised, the individual should be held responsible for only 20% of the loan. However, it's far from clear that companies would play ball, nor that any entity other than (inevitably) the government would be willing to swallow those 80% write-offs. Kaplan concedes that 'there are many details that would have to be fleshed out'. Yes, you could say that. 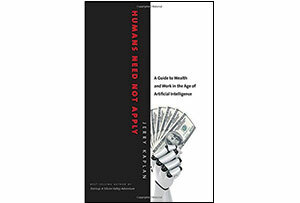 The author's assumption is that the growing use of AI will result in wealth being concentrated in very few hands. He draws a stark contrast between the burgeoning wealth of Bezos (he takes a side-sweep at him for not using enough of his loot for great causes) and how tough life is for workers. It's all terribly unfair, but hand-wringing only gets you so far. Books about the march of the machines routinely prompt worthy phrases like 'salutary warnings', 'timely reminder', but in practice they rarely have much real impact on anything except the author's bank account. I suspect that this one will be no different. John McLaren is the chairman of the Barchester Group, a non-executive director of several companies in the UK and US and a novelist. Will the robot revolution bring economic meltdown?